It always pleases me when two polls taken close together have very similar results. Even if they make out to be wrong some speculation of mine. So yes, it’s looking like Herman Cain isn’t exactly being helped this week. And if the new Rasmussen poll is genuinely showing a trend from the previous national poll, then he needs this story done as soon as possible. Eyes are wandering. The facts: 1000 likely Republican voters, mostly phone polling but with some alternative outreach to hit people without phones. MoE 3. As I said, this poll doesn’t change much from the last poll. 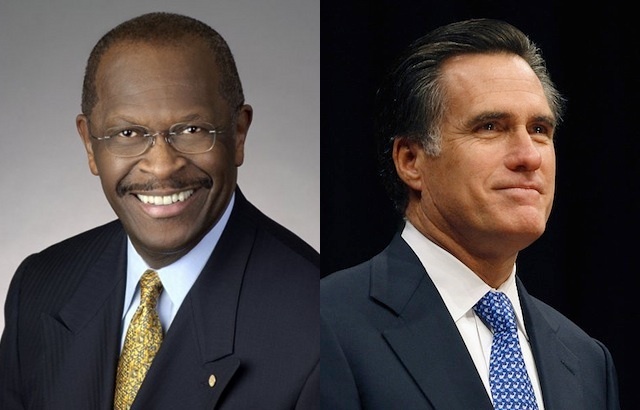 The order is Cain, Mitt Romney, Newt Gingrich. In fact Romney’s 23, Rick Perry’s 8, and Ron Paul’s 7 are all exactly the same from the Quinnipiac poll. The only change is that Cain is down four points to 26, and Newt Gingrich is up four points to 14. To be clear: There’s a 1/3 chance that a four point swing from one poll to the next here doesn’t actually mean anything. As funny and perfectly coincidental it is that Gingrich gained what Cain lost, just as some people predicted would happen, we don’t really know yet that it’s happening. But if I’m Herman Cain, then I’m taking it as a serious possibility, and choosing my strategies accordingly. I survived the 9-9-9 debate when Romney got hammered in the next debate. I may not be so lucky as to get the benefit of a mistake to swing back up after this. Gingrich also looks better in the Suffolk U. poll liberals are touting as proof conservs believe GOP is tanking economy to tank Obama. Of course, the liberals’ claims are askew, if you look at the crosstabs on the poll. For one thing, almost half those ‘conservatives’ think 0 is doing a good job. Yah. However, there’s an interesting comparison of how a candidate would do against 0, and Gingrich polled within 7 points. The poll was done among registered Florida voters, and because that question wasn’t politically slanted (like the econ question), I think that provides some useful insight. You might take a look at that poll, btw. Liberals are going to pick up talking points from it. One of the cheerleaders on the GOP tanking econ is Kevin Drum–he was a Journolister. Thing is, the poll undersampled the most conserv area of Florida, the northern part. Pollsters should really visit this state before they poll!